At Frontier, we love pets. However, movers are not permitted to move pets or live animals of any size. You will need to hire a pet mover or plan to move your four-legged family member on your own. Planning ahead to move with your pets will make your transition much easier and less stressful on your pets. There are many things you can do to make the move less stressful. The following information will outline some facts and ideas to making your pet relocation stress free. 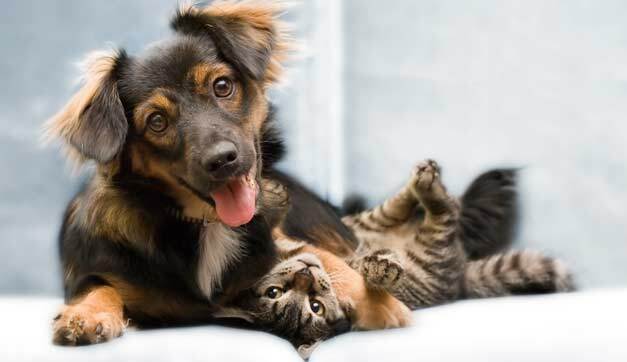 Certain rules and regulations may apply to pet ownership in your new town. You might be required to register or license your pet. Schedule a veterinarian appointment for a check-up before moving. Be sure they can handle the trip if you are traveling long distance. Get any required booster, parvo or rabies shots that might be required by your new location. Obtain a copy of your pets veterinarian records to transfer to your new vet. Generally speaking your pet will more likely be best transported in your vehicle with you. You will take the same caution and care as when you transport them to and from the veterinarian, pet sitter, kennel, groomers, etc. Pets become anxious and disoriented easily and it would be wise to drop your pets off at the pet sitters for moving day if this is possible. If you decide or have no choice having your pets home on moving day then you might consider clearing out a room such as a spare bedroom, guest bedroom, extra bathroom or a place to keep them from running or getting in the way. Be sure to alert each of the movers of the room where they are detained so they don’t accidentally open the door and let your pets run out. Be sure your pets have plenty of food and water and shelter if they are left outdoors. Be sure they have litter boxes for cats. It is also a good idea to make sure they have chew toys or activity items to occupy them during the move. Do not forget to set aside leashes, collars, health records, licenses, water and food bowls and anything else your pet might need immediately. Be sure your pet is wearing his / her license or tags in case your pet decides to run. It is a good idea to introduce your pet to the new neighborhood by walking your pet around the new area allowing him or her to become familiar with the new surroundings.